Dr. Allie Linton joined the Department of Obstetrics and Gynecology in August, 2017 as part of our Division of General Obstetrics and Gynecology. 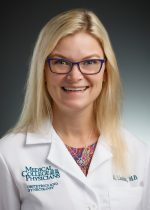 Dr. Linton received her medical degree from Feinberg School of Medicine at Northwestern University in 2011, followed by a residency in Obstetrics and Gynecology at McGaw Medical Center of Northwestern University from 2011 to 2015. She remained at Northwestern from 2015-2017, completing a Fellowship in Family Planning as well as a Masters in Public Health, prior to joining the Medical College of Wisconsin. In addition to being proficient in general obstetrics and gynecology, Dr. Linton’s areas of expertise include contraception in women with complex medical conditions, pregnancy options counseling, and management of complex pregnancies and pregnancy loss in the first and second trimester. Dr. Linton is actively involved in the education of residents and medical students, and received Northwestern’s “Excellence in Student Teaching Award” every year during her training. She is also interested in global health teaching and clinical care, with previous trips in Africa, Asia, and Central America. Most recently, she developed and taught an Obstetrics and Gynecology curriculum with a focus on family planning to refugee midwives on the Thai/Myanmar border. Dr. Linton sees patients in Froedtert’s Obstetrics and Gynecology Clinic and Froedtert’s Family Planning Clinic. Outside of work, Dr. Linton likes to spend time with her family and friends, watching movies and documentaries, rooting for her favorite football team, traveling, and running along the Lake.